The Rochester Knighthawks did their part, but their 12-10 win over the Toronto Rock on Saturday night at Blue Cross Arena wasn’t enough to secure them a playoff spot. The New England Black Wolves’ win over San Diego meant the ‘Wolves took the last Eastern Division playoff spot. The Knighthawks played spoiler, though, although it probably gave them little comfort once they stepped off the floor and heard the score of their competitor’s game. The Rock are still trying to catch the Bandits for a chance at a home playoff spot, and now they only have two games left in which to do it – they have to win both and the Bandits have to lose both of their last contests. If that were to happen, the Rock would finish second by virtue of their season series win over the Bandits. The Knighthawks are now on a modest two-game winning streak while the Rock have now dropped five in a row on the road, though they were coming off a thrilling 12-11 OT home win over Buffalo the night before. Warren Hill has been the difference for the Knighthawks in both games. Kieran McArdle and Kyle Jackson traded goals in the first minute of the game before settling down into defensive play. Darryl Robertson went five-hole on Nick Rose at the 11:19 mark and Rob Hellyer answered 1:02 later after Johnny Powless found him cutting to the net. Neither team looked primed for a run at this point, but that changed throughout the game. The second quarter belonged to Rochester and the third to Toronto. The rivals always play each other closely. The Knighthawks scored three straight in the second from Cody Jamieson and Mike Burke on power plays and Colton Armstrong on transition. Bill Hostrawser broke up the run with a power play goal for Toronto, but Ryan Benesch scored a pair before the half was out to put the ‘Hawks up 7-3. 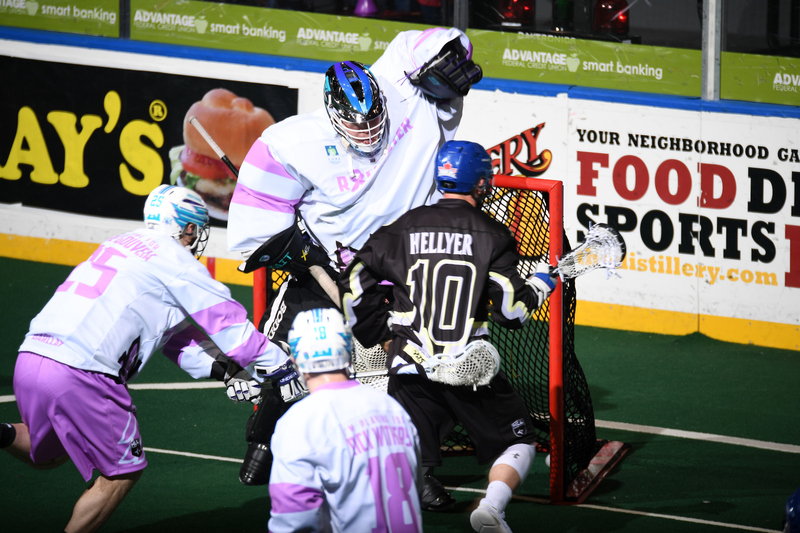 The Rock flexed more muscle in the third, outscoring the Knighthawks 5-4. Burke picked up his second of the game early before Toronto responded with a goal from Dan Craig and a bounce shot from Dan Lintner. Benesch replied with a backhander 14 seconds after Lintner’s goal. The teams traded goals the rest of the period, with Tom Schreiber tallying twice for Toronto and Latrell Harris once. Burke and Jamieson replied for Rochester. Down 11-8, Johnny Powless potted a pair of goals to bring the Rock within a goal by the 5:31 mark of the fourth. A keen eye and a timely challenge from Rock head coach Matt Sawyer caused the refs to call back a Benesch goal with around four minutes left to keep the Rock in it. Chris Boushy’s empty netter with seven seconds left did count, though. Nick Rose was pulled after the Knighthawks’ 11th goal at 7:56 of the third quarter. Riley Hutchcraft stopped all 14 Rochester shots in relief. Hill made 42 saves for the Knighthawks.